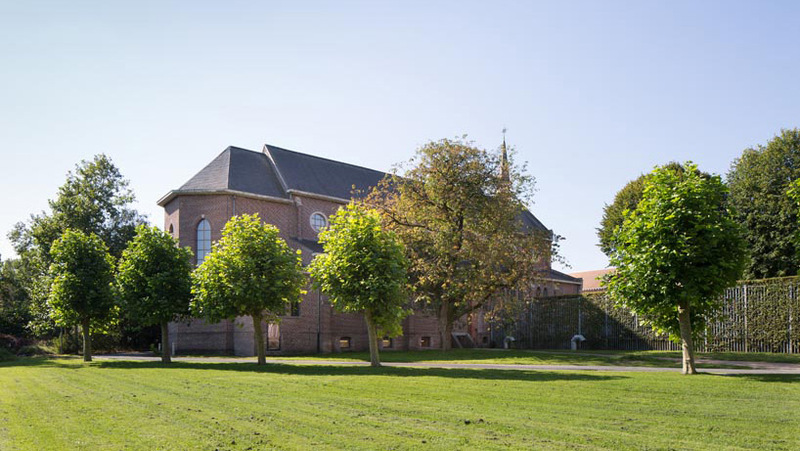 all images courtesy of de architekten cie.
‘campus ruiselede’ sits amongst a vista of farmland in the belgian province of west flanders. 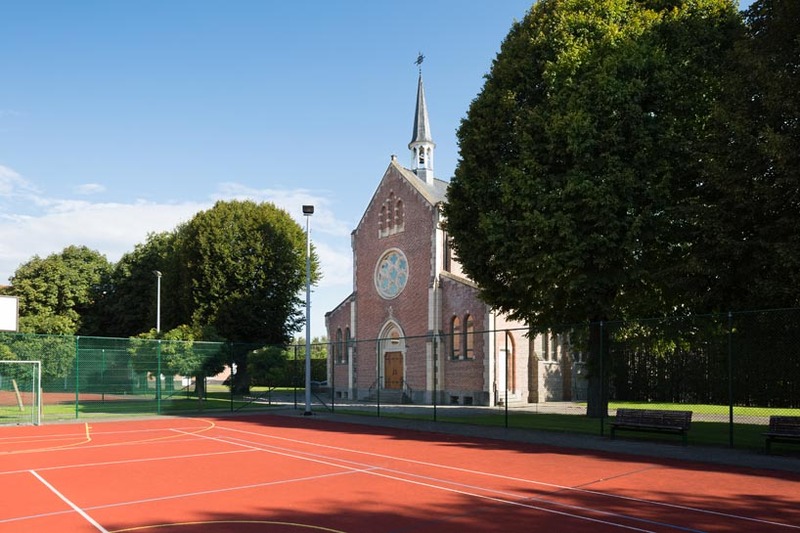 part of the community institution de zande, the structure serves as a school house for boys between 12 and 18 years old. 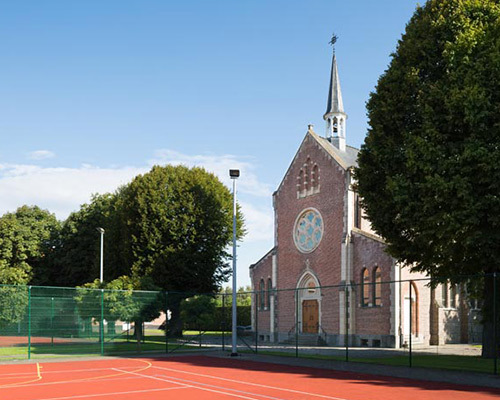 on the edge of the property is a chapel, which has been converted into one of the school’s principle amenities and houses indoor sports facilities, a media center, and extra classroom settings. 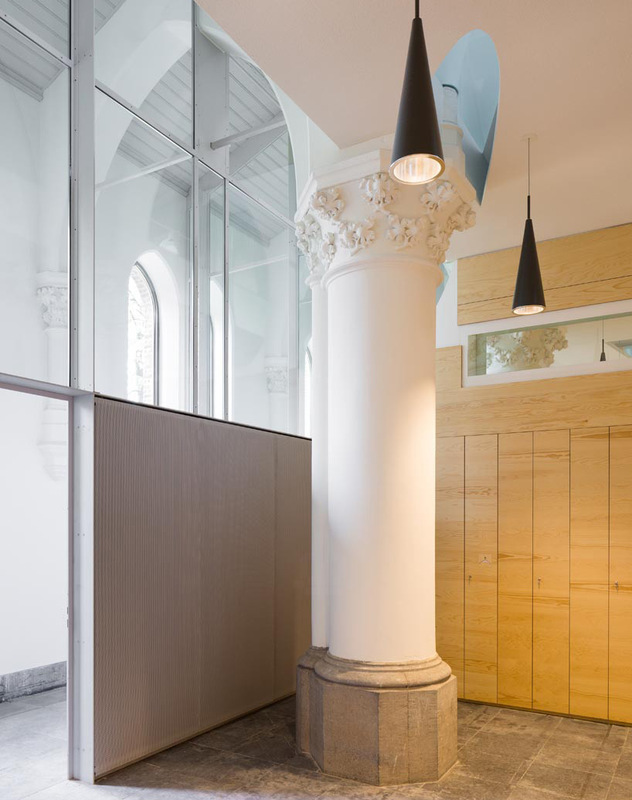 architect rob hootsmans of dutch firm de architekten cie. was placed in charge of the refurbishment, and worked under flemish master builder marcel smets to ensure the structure — built in 1856 — remained as historically unchanged as possible. 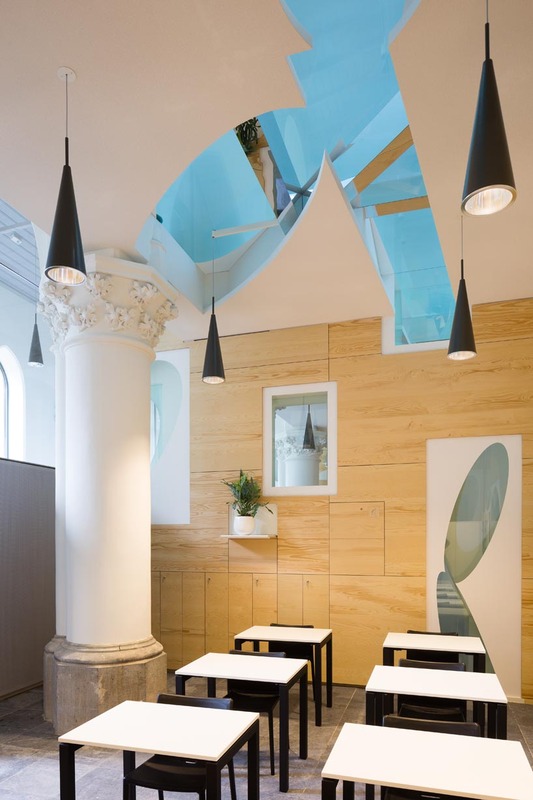 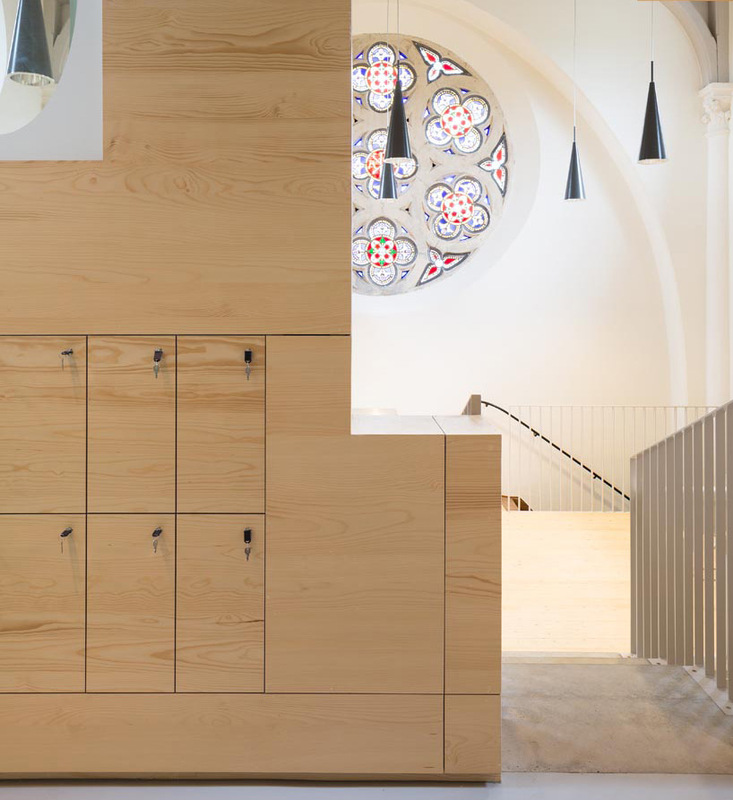 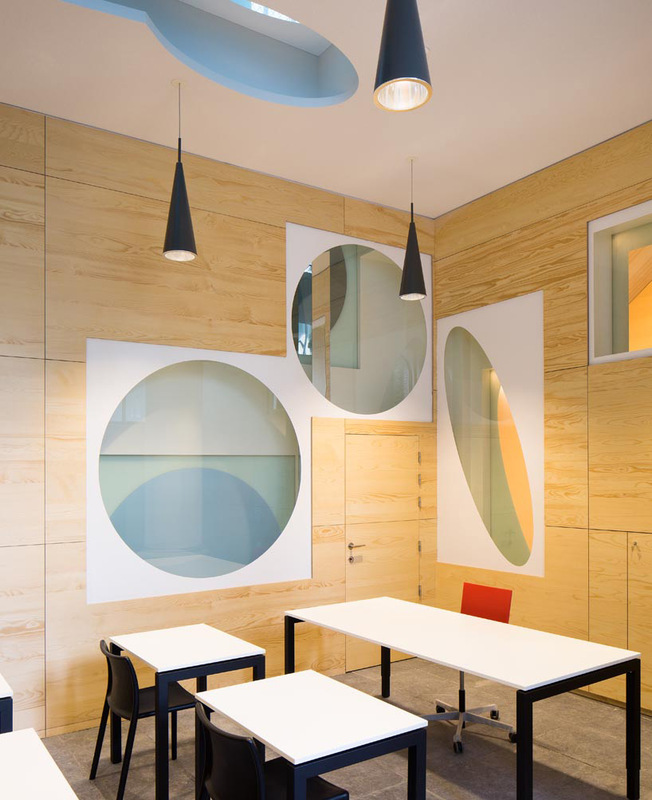 the interior of ‘campus ruiselede’ is what one might expect from a chapel turned school house. 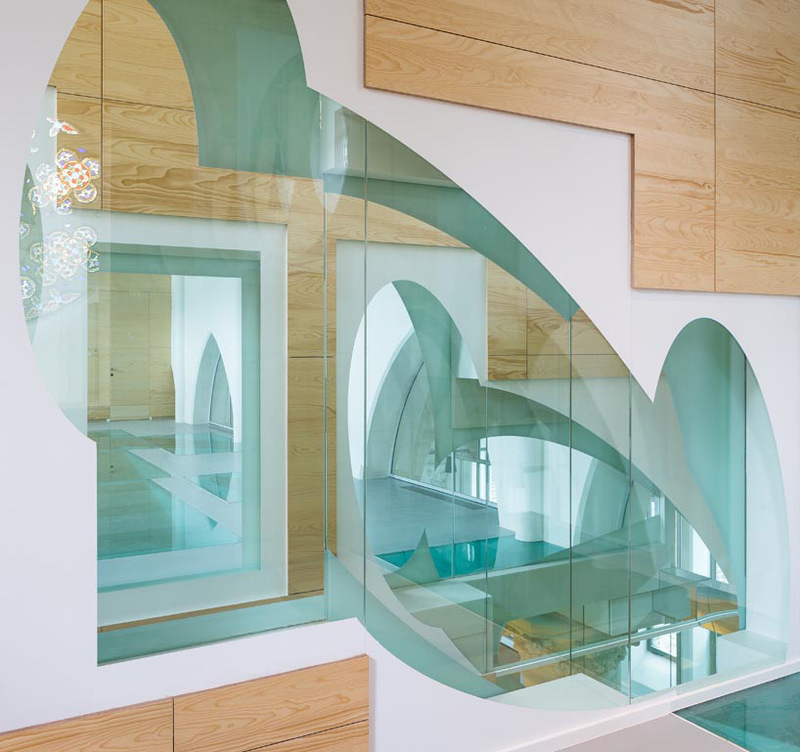 it relies heavily on verticality, spreading programs across three-stories, and amplifying natural light as much as physically possible. 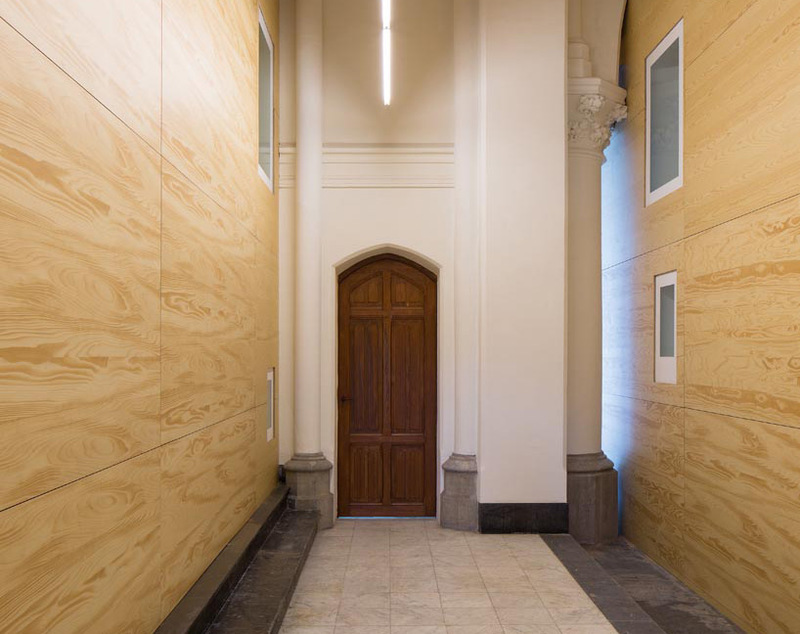 at the heart of the building, hootsmans and team designed a secondary form with double wooden walls. 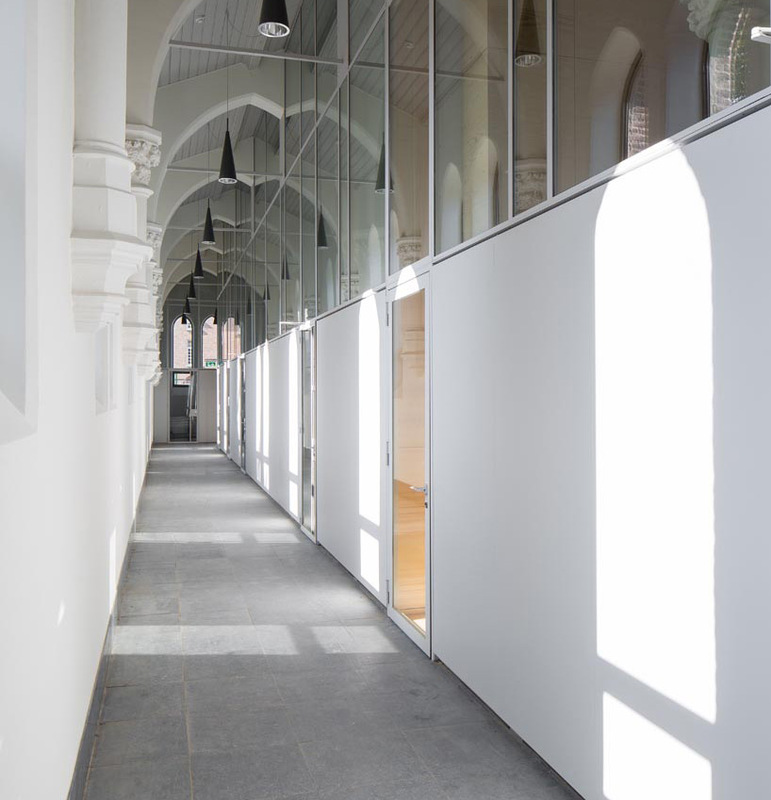 the space within a space differentiates corridor areas from classes and hides all unsightly infrastructure such as wiring and other equipment. 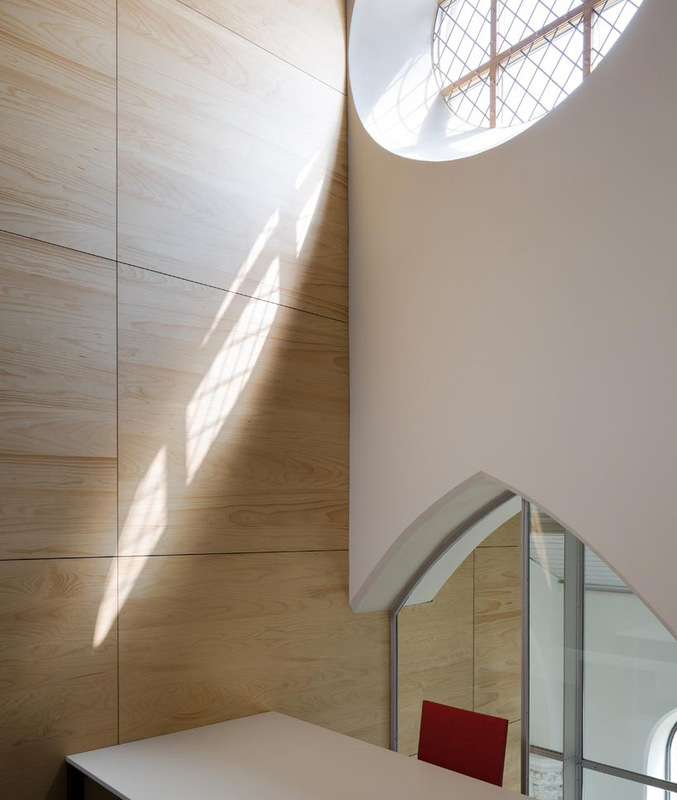 daylight enters rooms indirectly through round windows located high up in the chapel, and is viewed as vital for learning; the sunlight that is. 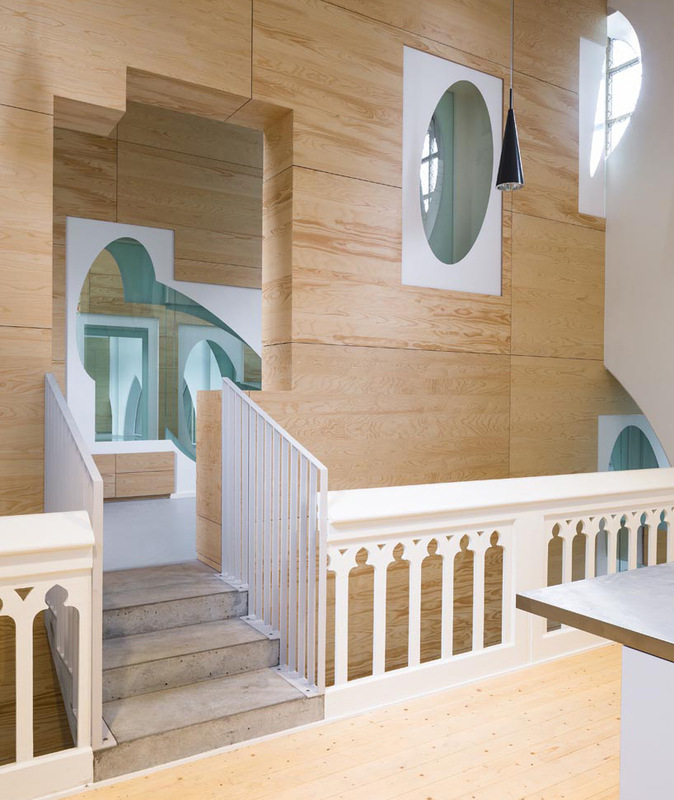 in aid of the upwardly placed windows, is a series of strategically fragmented transparent elements that influence luminescence throughout. 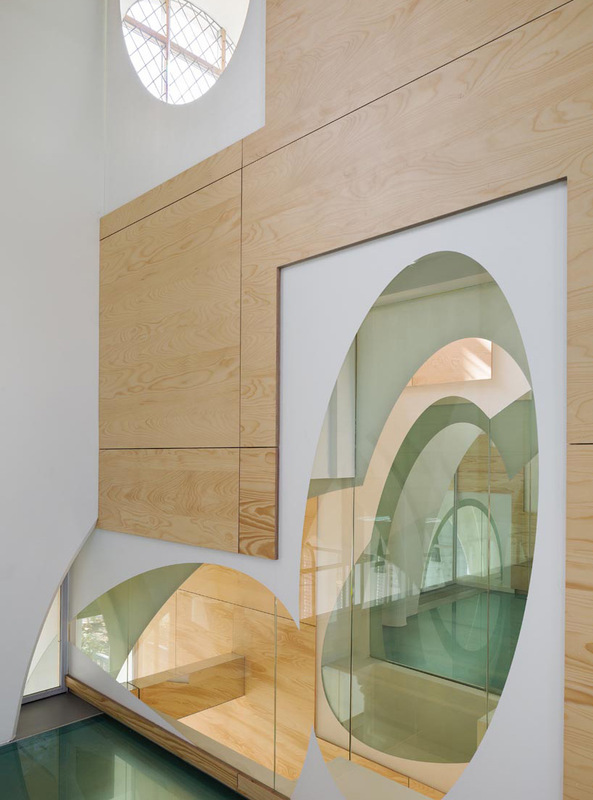 this feature was motivated by the 1952 dali painting, ‘galatea of the spheres’ and simultaneously separates and connects the overall, monumental form.